Hardwood floors add warmth, natural beauty, and value to any home in Beverly, Massachusetts. ScreenCoat Painting & Flooring LLC has a wide variety of both natural hardwood and engineered wood flooring. Customize the look of your floor by choosing the stain, gloss level, edge detail, width, and texture to perfectly complement the style of your Beverly home. ScreenCoat Painting & Flooring LLC has been in the hardwood floor installation business for 18 years, serving Beverly clients since 2001. Looking to install hardwood floors in Beverly, MA? 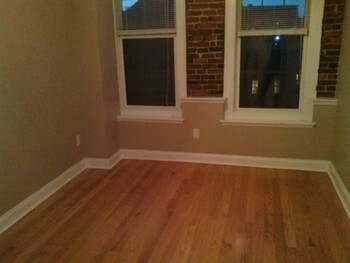 ScreenCoat Painting & Flooring LLC hardwood floors are expertly crafted using the finest domestic and exotic hardwoods. For your Beverly home, choose from ash, birch, cherry, exotic, hickory, maple, oak, pecan, or walnut. Our solid wood flooring is 100% hardwood milled from lumber. Natural hardwood reacts to humidity and extreme temperature changes by shrinking or expanding. Therefore, it is not recommended for basements or bathrooms. Engineered wood flooring is constructed by gluing layers of wood together. This multi-ply structure makes engineered wood much stronger than solid wood. It is also far less susceptible to humidity and temperature changes. Engineered wood is a great choice for finished basements. Beverly customers can rely on ScreenCoat Painting & Flooring LLC for professional hardwood floor installation with the highest quality materials available. All of ScreenCoat Painting & Flooring LLC's hardwood flooring comes pre-finished. Which means there's no dust from sanding, no fumes from chemicals, and no waiting for the finish to dry when we install a hardwood floor in your Beverly home. Factory applied urethane finishes are much tougher and last up to 20 years longer than site-applied finishes. Wood flooring is available in narrow plank strips, mixed width strips, or wide plank strips. For an upscale look in your Beverly home, choose parquet squares, which can be arranged in a variety of geometric patterns. We offer a variety of stains to perfectly complement any decor. Further customize the look of your hardwood floor by choosing a distressed or hand-scraped finish. The character of distressed hardwood give the floor in your Beverly home a naturally aged, rustic look. Hand-scraped floors are contoured to highlight the wood's natural beauty. We have a proven reputation for quality hardwood floor installation Beverly customers can rely on. Increase the value of your Beverly home with new hardwood floors. ScreenCoat Painting & Flooring LLC has been installing hardwood floors for 18 years in Beverly, Massachusetts. Call (978) 216-2016 to speak to one of our hardwood flooring specialists. Our professional hardwood floor installers are trained to precisely measure your room so you don't buy more flooring than you need to. We deliver and install your flooring and ensure that all project waste is disposed of properly. Instantly boost the value of your home with the timeless beauty of a hardwood floor in your Beverly home , professionally installed by ScreenCoat Painting & Flooring LLC. 5★★★★★ - "I moved into a new home in December. The person who worked on my floors did an atrocious job when he did show up, so I asked him not to come back. This has been going on since my move in and of course by this time all my furniture was in place. I tried to live with (and repair my own) what he had done because of the furniture issue. Finally I contacted Mike. He actually answered my call (no voicemail) and came by the same day giving me a price for not only sanding, sealing and applying three coats of poly but said he would move my furniture. The job was done exactly within the timeframe he gave me. He had to move the furniture from room to room and came back and forth several times a day to complete the job because of existing circumstances. Needless to say, I would highly recommend him. He is a professional and went above and beyond. I can't say enough good things about his service." 5★★★★★ - "Mike was a one stop shop! When renovating our dining room, he was able to refinish our hardwood floor and paint the interior walls/ceilings. He even fixed the second floor shower drain that was leaking and leaving stains on the ceiling. We got 3 contractors rolled into one. He did this with a quote that beat out all the rest who bid on my job. Mike is professional, punctual and most pf all trustworthy. It's not often you feel you got a value and your moneys worth when using these type of services. I strongly recommend him for making your hardwood floors/walls look brand new!" 5★★★★★ - "We used Mike to refinish our living room and dining room floors. They came out awesome! We can't be happier with the service that Mike and his crew provided. Mike shows extreme professionalism when completing a job. He has a great sense style and offered many useful suggestions. I would highly recommend Mike for any interior home improvement job. He is a true professional that completes the work in a timely manner." 5★★★★★ - "Clear communication, great follow up, on time and on budget! It was a pleasure having Michael paint a large room in my house. It was a difficult room to paint and he did an outstanding job. I contacted Micheal on a Thursday and the job was completed with in five days. I highly recommend him." 5★★★★★ - "ScreenCoat repainted our new home from top to bottom and refinished all our wood floors. Mike was flexible with our demanding schedule in order to get us into our home as soon as possible. The work is done professionally and we are extremely happy with our 40 year old "new" home." 5★★★★★ - "Mike is an interior finishes contractor who specializes in hardwood floors and painting, both new and restoration, but more importantly he specializes in a responsive and responsible work ethic. He is punctual, respectful and does what he says he will do. The quality and thoroughness of his work is a major selling point of his services. ScreenCoat repaired and refinished our hardwood floors, some of which had been drilled for wiring and stapled profusely by a wall-to-wall carpet installer years ago. I strongly recommend ScreenCoat for your consideration." 5★★★★★ - "Mike and his partner Karl came in to fix what another flooring company did. They were professional, fast and cared about their work. They did a fantastic job and we highly recommend them. Good people. Great work. Fair prices." 5★★★★★ - "Mike and his company were top notch! They did all work in timely manor and on budget. My experience with screen coat was terrific and I always recommend them to my clients." 5★★★★★ - "Mike was just awesome. He and his partner communicated exactly what the process would be, made excellent suggestions, and was so quick and tidy. I love the way my floors look! Thanks MIKE!" 5★★★★★ - "Mike was always accessible and kept me informed throughout the job. They knew I was limited for time and they were very accommodating." 5★★★★★ - "Mike is fabulous to work with! His crew performed great work in my home. ScreenCoat came highly recommended to me from a close friend and their workmanship, communication, timeliness, attention to detail and reasonably priced services did not disappoint. Would hire again and would recommend. I love my new hardwood floors and the beautiful new darker stain. Thank you!" 5★★★★★ - "Mike from Screencoat was great. He responded quickly and came by to work up a quote on work on a Friday had an estimate with options broken down by work and price on Monday. Work was started in about a week from there. The job could not have come out better than hoped. My condo looks good as new even though it is almost 50. He even replaced the washer valve that started leaking when turned back on from painting behind. Have some more work to do and will be using Mike and crew again. Thanks, Mike :)." 5★★★★★ - "I put a request for our bathroom to be painted and within 20 minutes I had a call from Mike.....and the job was scheduled for the very next day!! Mike was honest, reliable and we were very happy with his work!" 5★★★★★ - "ScreenCoat Painting called me within 20 minutes of putting in my request and the job was done the following day!! You can't get better than that! Thank you!" 5★★★★★ - "I contacted Mike after I bought a new home and realized the hardwood under the carpet (for the last 30 years!) needed to be refinished. I had 10 days until I was planning on moving in and was desperately hoping someone could refinish and stain the floors for me. Mike was incredible. He was so responsive, willing to work with my crazy timeline and so quick. He did a beautiful job on the floors. There are a couple small areas that aren't 100% perfect, but so minor that only I can notice. Top notch customer service. Thank You Mike!" 5★★★★★ - "After being told by a painter that I would have to wait as many as six weeks for the work to be completed, I very much appreciated the speed with which you began and finished work in my home. I was both surprised and impressed that you chose to work on a Saturday and Sunday to complete the job." 5★★★★★ - "Mike took care of our three-season sun room and did an outstanding job. The original boards were covered under a rug for decades and needless to say, they needed a LOT of TLC. After shopping around, my wife and I decided that Mike would be the best guy for the job and he did not disappoint! Great prep work, great care of the overall space and excellent floor restoration work and clean up. He offered us some options, advised us on what might be the most optimal plan and did a great job taking care of the floors. Just a Professional guy all around. I would definitely use him again." 5★★★★★ - "Mike has done floors in my parents house as well as my own. I found him to be honest and hard working. He is easy to communicate with via email or text. We will definitely call Mike again for any flooring needs in our family." 5★★★★★ - "I was going to be away when Mike was coming in to do the floors. He made me feel comfortable that all would be ok. If I did have any questions, he got back to me right away. The floors came out gorgeous. We had him sand and stain the floors to a darker stain. We are very happy with the end product and will be using him for future projects!" 5★★★★★ - "What a pleasant experience!!! Not only did Mike get my rooms painted in a very timely manner, he did a wonderful job. I would highly recommend ScreenCoat. If you are looking for a quick service and a job well done, ScreenCoat is the one to call." 5★★★★★ - "Reliable, on time and reasonable. Easy to work with and flexible in getting the jobs done!" 5★★★★★ - "Michael was great, showed up on time and it was the price quoted. Made sure everything was to my satisfaction before leaving. Would definitely hire him again, thanks so much." 5★★★★★ - "Mike returned my phone call immediately. He gave me a very fair price for the job at hand. His crew was courteous, clean and friendly and the overall work was terrific. I would highly recommend Mike and his company, Screencoat!" 5★★★★★ - "Michael was excellent. He contacted me right away and was able to fit me in very quickly. He was clean and left the house clean after the job. The room looks beautiful. I would recommend to a friend." 5★★★★★ - "Mike's a great help & a great guy. While getting our house ready to sell we needed the floors resurfaced as soon as possible. Mike was right there to help with recommendations for the job and the timing for us was great! The results made our home last look fantastic!" 5★★★★★ - "We hired Mike to remove the wall-to-wall carpet in our new home and refinish the hardwood floors that were underneath. He and his associate did the job on our requested timeline, and the floors look fantastic." 5★★★★★ - "Imagine a contractor who responds quickly, identifies the problem, says what he can do about it, then does what he says when he said he would do it, and produces a top-quality job. That's Mike. We initially hired him to refinish a bedroom floor. The results were so good, in terms of quality and responsiveness, that we asked him to do some painting. He painted three rooms, all of our downstairs popcorn ceilings, removing water stains from one and making all of them look brand new. He and his crew moved furniture in and out of rooms and cleaned up afterwards. Great work, great responsiveness, great guys." 5★★★★★ - "Mike and the employees of Screen Coat were professional and finished the job in a timely manner. I highly recommend. Our floors went from drab to fab!" 5★★★★★ - "Very accommodating of our schedules and very reasonably priced. His quote was perfectly accurate and his teams knocked out the job in 2 days, leaving the property as free from dust/debris as possible given the nature of the work." 5★★★★★ - "I didn't actually use Mike as other projects ended taking precedent. He was very prompt and easy to work with and will hire them when time is right." 5★★★★★ - "My wife and I were going away for a week, and at the last minute, decided to find someone to refinish our stairs while we were away. Mike was willing to do the job on short notice. He kept in touch every day by phone and text (even sending us photos of the "before and after"). The work was excellent, and Mike was easy to work with and a consummate professional. We even came back to find the house cleaner than when we left." 5★★★★★ - "I had a small apartment that needed to be painted and some floors that needed to be lightly sanded and have a light coat of polyurethane. The work was done on time by the owner and his associate and was of the highest quality. The apartment looks great and I would certainly use this company again." 5★★★★★ - "Very happy with the work they did. Great quality done in a timely manner. Would highly recommend Screencoat." 5★★★★★ - "My wife and I bought a new bedroom set and decided to have the room painted before it arrived. The furniture was due to be delivered on Tuesday but we didn't decide on paint until Saturday. I reached out to Mike through Thumbtack on Saturday to explain the tight schedule and he had a crew at my house at 7am on Monday morning and finished the job that day. He was courteous, understanding and the room came out great! We can't be happier with our new room." 5★★★★★ - "Mike and I had a bit of back and forth before the project actually started. He was able to give me a base quote having only seen photos and given the dimensions. We had to wait to close on our home before we could come in and see the space. He removed wallpaper in the dining room for us, repainted the walls, wainscoting, and crown molding. He painted the nursery upstairs for us which we didn't have time to tackle before the move, and he sanded and coated the downstairs floors and two of the bedroom floors for us upstairs. Everything looks amazing. More than I was expecting. Mike's attention to detail is fantastic and he was a pleasure to work with: punctual, responsive, and worked in our timeframe." 5★★★★★ - "Throughout the work that involved sanding and refinishing an oak hardwood floor, Mike and his crew exhibited all of these qualities: Politeness, Punctuality, Professionalism, Perfectionism. They were Perfect for the work I required. I am very Pleased with the quality of their work and am happy to recommend Screen Coat to others." 5★★★★★ - "On behalf of my fiancé and I, we want to say THANK YOU for the unbelievably beautiful job you and your guys did on our floors. They are absolutely gorgeous and have become the centerpiece for the house. The finish, looks and feels great and everyone who has stopped over to visit are amazed at their beauty. Mike's professionalism, price, competency, and punctuality is something that is nearly impossible to find these days. We can't thank you enough and will be sure to refer you for anyone that is looking to have their floors done!" 5★★★★★ - "Mike and his team worked on three projects for me: refinishing floors, installing new floors to match the existing floors, and installing hardwood stairs. Mike differentiated himself from other vendors I’ve used in two areas: 1) quality of work; and 2) communication. From a quality standpoint, the refinished floors were flawless and looked brand new when done. The new floors were a perfect match and this was particularly impressive given that the old floors were not a common wood. Also, Mike fixed some minor flaws that a previous vendor had left - such as spacing between the stairs and the old floor – without even being asked. That’s the type of professional he is. Throughout the projects, he was committed to my being happy with the quality of the work. Mike was also easy to get hold of. He was in constant contact during our initial discussions as well as throughout the project. He responded to phone calls, emails, and texts within hours rather than days. As those of you who have done home renovation projects already know, timely communication is not always a strong suit with some of the vendors, and it made a big difference here. I highly recommend Mike, and would hire him again in a heartbeat." 5★★★★★ - "Mike transformed our 1,675 square foot condo in a timely fashion from a ugly and poorly taken care of condo to a beautiful home for my family. He painted every room in the condo exceptionally well with a great attention to detail. He ripped up all the old wall to wall carpeting and put in hardwood floors and stained them..they are GORGEOUS! He did all of this in a timely manner and answered any questions we had (which were many) on a daily basis. Everyone who has seen the before and after have been so impressed it literally looks like a different home. I highly recommend Mike/ScreenCoat for any flooring and painting needs. He is a true professional with great attention to detail!" 5★★★★★ - "Outstanding service, prompt, professional. Rooms look gorgeous. Mike is easy to reach, responds quickly and did our rooms in much less time than we though it would take. You will be happy if you hire him!" 5★★★★★ - "Mike was prompt in his communication and everything was done with precise detail." 5★★★★★ - "Mike and his team painted a room then sanded and stained our hardwood floor. He and his crew were on time, professional and communicative throughout the process, and the cleanup was impressive as well. We highly recommend their services and will be using them again in future." 5★★★★★ - "We wanted to have our family room parquet floor (14x24) refinished. They look FABULOUS!! The work was done within our time frame. Great attention to detail. Very professional, and clean, courteous, and prompt! And Mike gave us quotes for installing hardwood floors in two other rooms. And then I found out he does painting as well!! My new best friend, to help update this 34 y/o home!! We could not be happier, and we HIGHLY recommend Mike and Screencoat for your floors - refinishing/ installing. What a great find!!!!!" 5★★★★★ - "This is the first time that I have hired Mikes company from a friends recommendation. His service has been above and beyond anything I expected. The quality of their work is superb! Everyone that sees their work thinks they have done a wonderful job. Inside they did all ceilings, walls and trim and even my built-ins. I have even left them in my house to work alone without a worry. He and his crew are very friendly and easy to work with. I just can't say enough good things. I will recommend them to anyone that asks and maybe even if they don't ask." 5★★★★★ - "I don't typically take the time to write testimonials but my experience with Mike has been so positive that I am prompted to do so. If you are like me and hesitate to hire painters for a variety of reasons (thinking you can do the job, wonder about the end result and cost, etc.) - you will be happy with this decision. Competent, clean, courteous service, O Ya, and It looks Awesome!!!" 5★★★★★ - "Mike was incredibly responsive and professional. I called him over the 4th of July weekend and he came over within an hour to provide me with a quote to get our floors refinished. We are preparing our house for sale so the timing was of critical importance. Mike and I agreed to a scheduled date and he showed up right on time with his crew. I highly recommend that you contact Mike. He is a nice guy, runs his business like a professional and does nice work. We are very happy with how our floors came out and know that they will have a positive impact on the sale of our house. Thanks Mike!" 5★★★★★ - "Mike and Carl were fantastic! I hired them to buff and coat my hardwood floors in my dining/living rooms. They were prompt, professional and courteous. I received 4 quotes from different contractors, and although not the cheapest (or most expensive) I couldn't be happier with the results! Totally rejuvenated my beat up hardwood floors, and the left my house cleaner than they found it. Can't recommend these guys enough!"